I've preserved a few things in my life, like apple butter and antipasto, and while it does take a little work, I'm always so pleased with the results. Amy's beautiful book has me wanting to do more of it this summer and fall, while produce is at its peak. 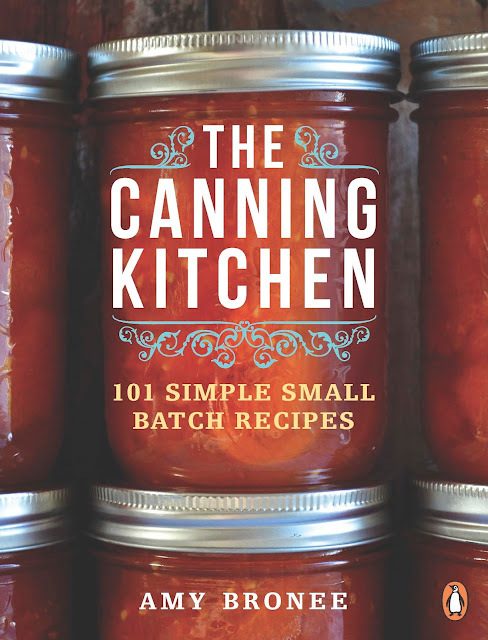 Whether you are just new to the world of canning your own food, or a seasoned pro, you'll find lots of delicious recipes and helpful tips in The Canning Kitchen. Amy goes through the type of equipment you need and has written a step-by-step checklist to safely preserve each recipe. This is super useful to someone like me who knows a little but not a lot about canning. 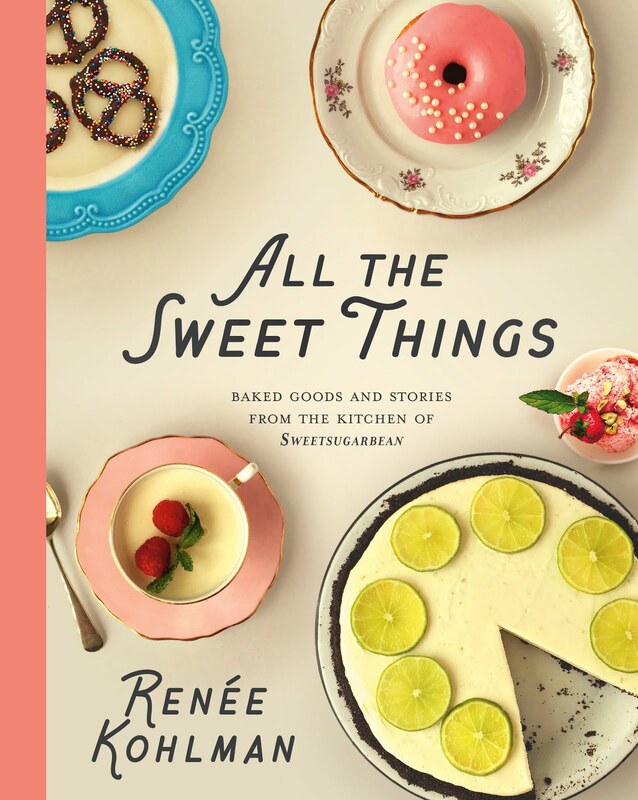 All 101 sweet and savory small batch recipes, from jams and jellies to chutneys and pickles, are beautifully photographed by Amy. I'm swooning a little over the Country Peach Cobbler Topping, Red Wine Cherry Chutney and Raspberry Cocoa Jam. Her book blends the traditions of home preserving with a bit of a modern spin. I'm inspired to hear the pop pop pop on my counter later this summer, and if you're a canner, you know what I'm talking about. 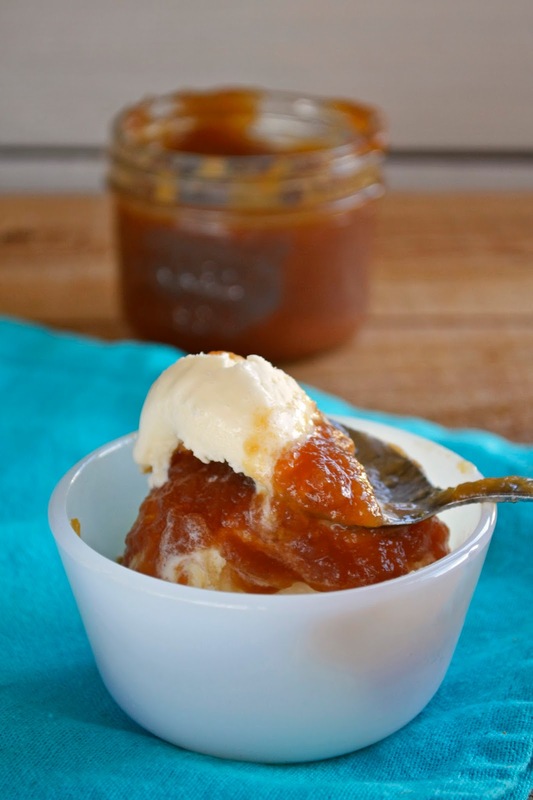 Amy and Penguin Canada have generously shared her recipe for Salted Caramel Pear Butter (another stunner!) and the opportunity for you to win your very own copy of her book. Just leave a comment below telling me what you love to can or hope to learn how to can this year. Deadline is Thursday June 18, 2015. I look forward to your responses! Happy Canning! Saskatoon Friends! Amy will be signing books here in our city Thursday July 9th at McNally Robinson Bookstore! The fun starts at 7:00 pm. Be sure to pop by and say hi! What Amy has to say about this recipe: This decadent pear butter proves that dynamic flavour can come from just a handful of simple ingredients. Slow cooking turns pears, brown sugar, lemon juice and salt into a deeply coloured, sophisticated dessert sauce. Spread this between cake layers or spoon over vanilla ice cream. I love all things pear and all things caramel and I so can't wait to try this. Thanks Amy! Rinse the pears under cool running water. Remove and discard the stems, peels and cores. Dice the pears, adding them to a large, heavy-bottomed pot. Crush with a masher. Bring to a bubble over high heat. Lower the heat to medium and continue cooking for 10 minutes, stirring frequently. Purée the pears using an immersion blender or standard blender. Stir in the brown sugar and lemon juice. Return to medium heat and let bubble for 80 to 90 minutes, stirring occasionally, until darkened and thick. (You may need to lower the heat to medium-low and stir more frequently toward the end to prevent scorching.) Remove from the heat. Stir in the salt. Ladle into 6 clean 250 mL (1 cup) jars, leaving a ¼ -inch (5 mm) headspace. Follow the manufacturer’s instructions on the packaging for preparing lids for processing. Position new flat lids over the clean jar rims and secure in place by twisting on the screw bands just until fingertip tight. Not too tight—some air will need to escape during processing. Place jars in water bath canner, covered by at least 1-inch (2.5 cm) boiling water. Cover canner and process for 15 minutes. Start timing when water in canner returns to full boil. When the processing time is up, turn off the heat and remove the lid. Leave the jars in the canner for 5 more minutes. Remove processed jars from the canner and leave to cool for 12 to 24 hours. Do not tighten the screw bands while the jars are cooling. Once the jars are fully cooled, press the middle of each lid to check for a vacuum seal. If the centre of the lid is suctioned down, your jar has fully sealed. TIP Any pear variety can be used to make pear butter, so use your favourites. 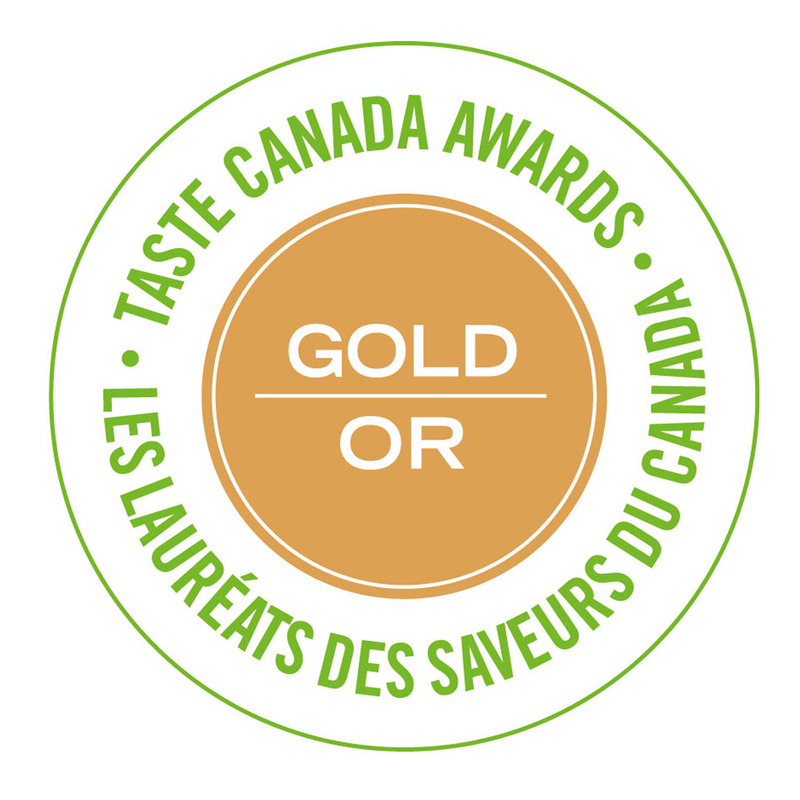 Bartlett and Anjou are nice choices. To know if your pears are ripe, just check the neck. A ripe pear will give slightly when pressed just below the stem. I love canning salsa and peaches. Sometimes I spice the peaches with fresh ginger and cinnamon. Yuuuum! I love canned peaches too! I just bought my first canning pot w the extras... Hoping to channel my mom's canning prowess! And something that works for my husband's pre-type 2! You sound like you're ready to can. I'm sure some of your mom's prowess will rub off. Good luck! Your lot of land sounds perfect. Good luck! I love being on the receiving end of canned good gifts. Amy's book has great ideas for pickles and chutneys. Best of luck! Hi Karen, I love homemade salsa too. Best stuff! Good luck! Amy did a great interview on Global Toronto this am! I love canning pickles- especially cucumbers pickled bread and butter style. I'd love to try canning a fruit butter (my cousin has a fantastic apple butter recipe that I spread on toast and plop onto chicken), since I normally just stick in the fridge and eat it so fast that I don't need to can it. Heather, fruit butters are the best. Whenever I make my apple butter I hoard it like gold! Best of luck to you! I'm what my friends call a canning addict, I'm always trying a new jam, or a relish. I want desperately to get more into marmalade sand pickles. I've never tried making a fruit butter, so I think that's my summer objective! Wow! Sounds like you are a bit of an addict. Good for you! Fruit butters are pretty dreamy - highly recommend! I have made jam, but would love to try more canning. Amy's book looks great. Thank you for the chance to win. Joan, you would love this book. Good luck! I try and make salsa every fall. I also make apple sauce from my parents crab apples and I love chokecherry syrup. I love your blog I am a Saskatchewan girl at heart living in Calgary. I love to can my homegrown tomatoes. Also, an unexpected favorite of my family has become pickled dilly beans from the garden! Hey, hey, Renee....you know I love the canning! With 3 hockey players in the house, we wouldn't make it through the winter without my homemade tomato sauce. Last summer I canned 24 pints and I'm now carefully rationing the final jars until tomatoes are at their peak in August. This cookbook looks like a ton of fun! Chelse, look at you! That's a lottsa tomato sauce! This book would give you plenty of great canning ideas. Good luck! I love to can jam. I can strawberry, blueberry and plum every year. I would like to try apple butter this year. I love homemade jam. Nothing better on hot buttered toast! Good luck! I just want to learn to can, period. I've done a few freezer jams but really want to make the real deal...this book looks perfect! Jenn, this is a great book for those new to preserving. Good luck! This year: salsa. And as of now: Salted Caramel Pear Butter too. Peaches are a must for my family. Usually just in plain syrup, but I like to spike a few jars with Bourbon and a cinnamon stick! Justine, those peaches sounds insane! Bourbon and cinnamon? Yes, please! I try to can up fresh fruit jam during the summer, to give as gifts for Christmas! Can't wait to try these delicious flavor combos! Oooo, I think I've found this year's new canning project - thanks for the recipe! I lug my old canner upstairs in mid-July and it stays in the kitchen until October, going through pickled cucumbers and beets, tomato sauce, chutney (I tried a pear one last year), peaches, pears, and my favourite- Jellies! (apple, chokecherry and pincherry). Summer comes officially to a close when the canner makes the trip back downstairs.